The Mustang rocket is being prepared for launch at Spaceport America. New Mexico Tech’s Student Rocket Design Team launched the first Mustang rocket from Spaceport America at dawn on Saturday, Nov. 4. The launch of the Mustang, the largest rocket ever attempted by NMT’s program, culminated 15 months of design and construction work for the student group. Despite a textbook ignition and clean bright plume, the rocket did not reach its intended apogee of 24,000 feet, but an impressive number of objectives were achieved. Early analysis indicates that every subsystem designed and built by the students performed nominally, including recovery of the payload bay, which was intact. The rocketry team developed the Mustang 6A in collaboration with White Sands Research and Developers, LLC (WSRD), an aerospace company based in Las Cruces. Tech’s Mechanical Engineering department chair, Andrei Zagrai, had long realized that the relationship between academia and industry has the highest potential to advance the university’s rocketry program. The CEO of Spaceport America, Dan Hicks, said the spaceport was proud of the New Mexico Tech team and its student members for their recent launch effort. “We are pleased to work with these fine examples of the next generation of space industry engineers and scientists,” Hicks said. Design of the Mustang’s external shape, began in WSRD’s laboratory in the summer of 2016. 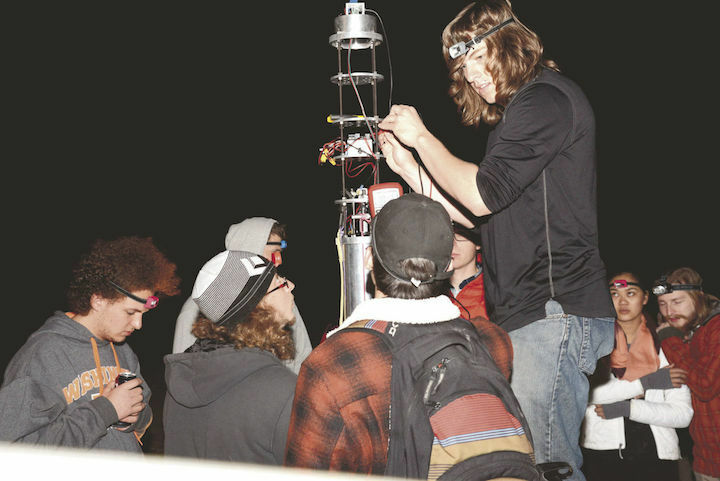 When the fall 2016 semester started, Paul T. Jaramillo of WSRD presented the Mustang to the NMT Rocket Team as a design methodology that could eventually make it all the way to space. The first step was the fabrication of the six-inch diameter, 10-foot tall version of the Mustang, which would be the largest rocket ever attempted by NMT’s rocket program. The Mechanical Engineering faculty also saw the Mustang as a path to enhance Tech research opportunities with a platform capable of hosting cutting-edge research. Subsystem designs began in earnest in the fall of 2016. It culminated in this latest successful launch.